In its early days in the 1920s, Castle Heights was just a grassy hill at the end of the streetcar line, with a clear view of the Amicable building downtown. The city of Waco has since grown miles beyond the hill, and oaks and magnolia trees have grown up to shade the neighborhood. Through the decades, Castle Heights has remained a prime address for the Waco establishment, impervious to inner-city blight. Castle Heights has an unusually strong identity as a neighborhood. 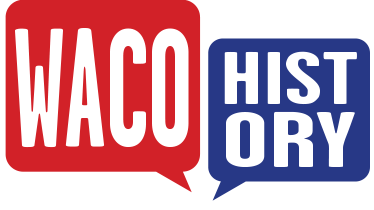 The construction of the earliest homes, circa 1888, lied outside Waco city limits, and when developers plotted the neighborhood in 1923, they expected it to serve as an elite residential area marketed to the professional and upper class. Residents fought back in court in the 1930s when Waco sought to annex them. The neighborhood incorporated as the Village of Castle Heights in 1939 and elected a mayor, A. Baker Duncan, father of modern-day civic leader Malcolm Duncan. However, the village disbanded in 1945 and was annexed into the city of Waco. 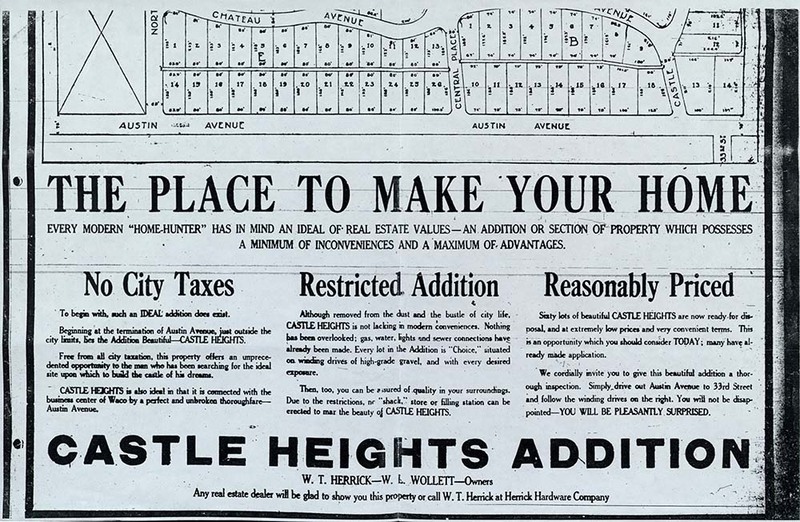 Castle Heights, with its then-novel curving streets, was an example of the early twentieth-century City Beautiful Movement, an urban planning philosophy that sought to link social issues to architectural design and encourage civic pride and engagement. Large plots of land with space for big backyards and attached garages attracted potential residents. The eclectic architectural styles of Castle Heights provide good examples of design from several different time periods, including Colonial Revival, Tudor Revival, Spanish Eclectic Revival, and Minimal Traditional homes. Following World War II, the neighborhood saw a large boom in construction of homes in the ranch style. Many houses are also notable because they were designed by famous Waco architectural firms such as Birch D. Easterwood and Son, or designer of the Amicable building, Roy Lane. Through over a decade of effort by neighborhood leaders, Castle Heights became Waco’s first historic district listed on the National Register of Historic Places in 2009. 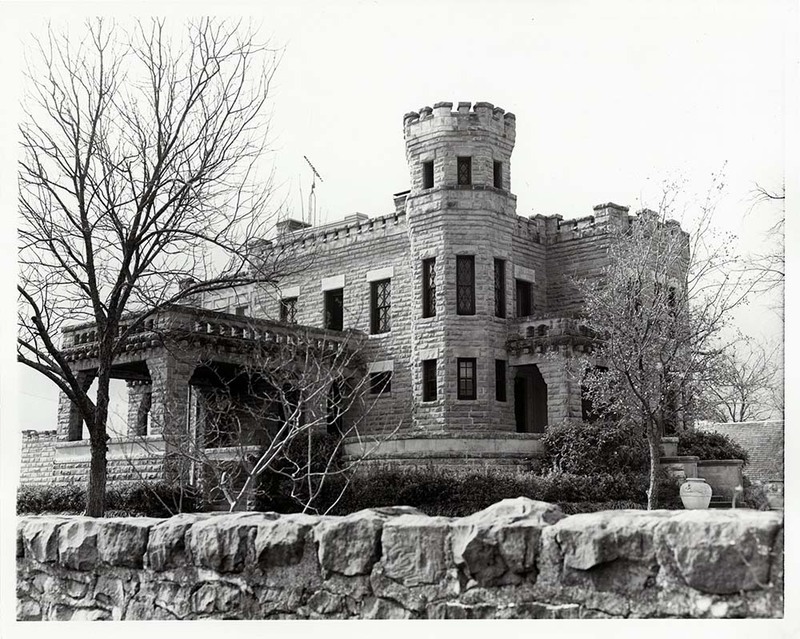 The district included on the historical marker encompasses most of the area north of Austin Avenue from Thirty-Third Street to Thirty-Ninth Street, including Cottonland Castle, the 1890s Gothic stone structure on Austin Avenue that gave the neighborhood its name. Today, Castle Heights remains one of the most sought-out neighborhoods in the city. Its well-preserved homes serve as physical evidence of twentieth-century architectural and urban design in Waco. J. 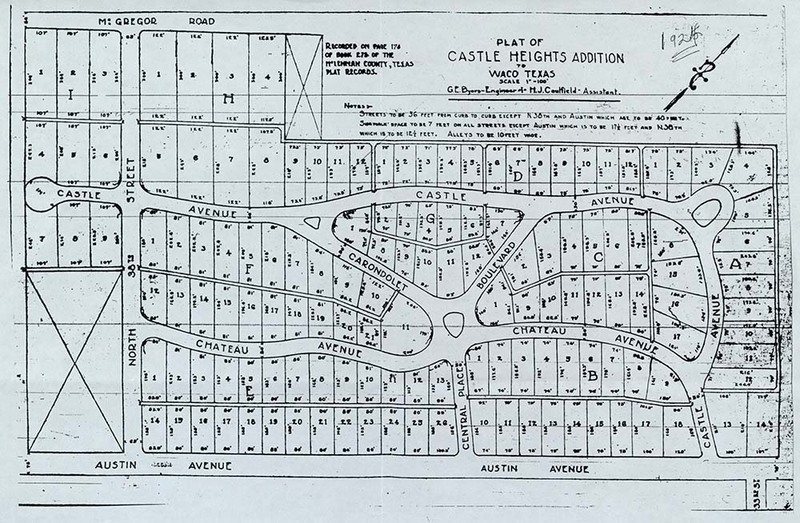 B. Smith, “Castle Heights Neighborhood,” Waco History, accessed April 26, 2019, https://wacohistory.org/items/show/115. A version of this article originally appeared in the "Brazos Past" column of the Waco Tribune-Herald.Smith, J. B. “Castle Heights: From Outskirts to Heart of City.” Waco Tribune-Herald. May 10, 2008.